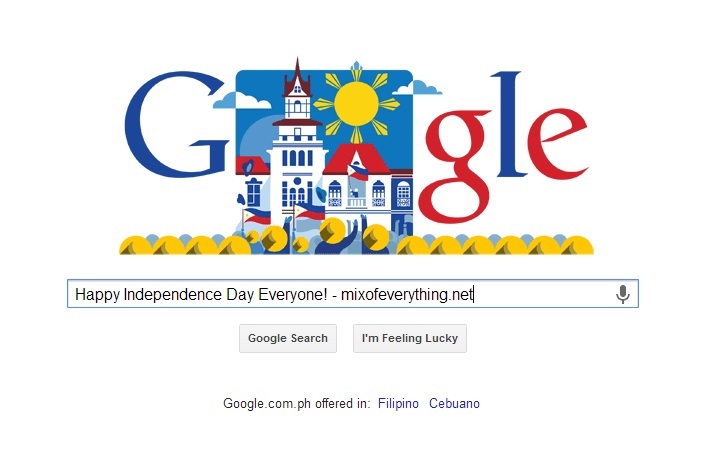 Happy Independence Day from Google and from Mixofeverything.net - Hello! Welcome to my blog! Happy Independence Day everyone!!! Yes... 115th year of our freedom and yet I can't seem to feel it. I can't seem to feel proud and actually feel the freedom-ness of this celebration. I don't know when did it start feeling like this but I think that we Filipinos actually made it like this. In the past 20 years or so, morale of Filipinos and the pride of being free went down. If not for the crime and traffic stopping Pacquiao before, The outcome of the electiosn and the girl (now boy) Filipino pride singer Charice coming out. Where do we stand now really? Anyways, I think the Philippine still has a chance to make up. We have a long long way to go, and far from our other Asian countries like Singapore. Why do I feel like the world is waiting for us to make this one big mistake? Anyways, let's stop all this and just celebrate this so called holiday. For tomorrow is another slave work day for us and this day will just be another day in history that will soon be forgotten.